Mr. Jiang Feng and his wife. Jiang "disappeared" from Shanghai airport in mid-February. New York—In the run-up to the World Expo opening in Shanghai this week, the Chinese authorities have engaged in a sweeping crackdown against local residents known to practice Falun Gong. At least 127 Falun Gong practitioners have been abducted since February 2009, according to reports received by the Falun Dafa Information Center (full list). Over two dozen (26) of them have then been arbitrarily sent to prison or labor camps for up to 7.5 years (full list). Others have been taken to local “brainwashing” classes aimed at forcing them to renounce their belief in Falun Gong. Given the difficulty of obtaining information from inside China, the actual number of Falun Gong practitioners detained ahead of the World Expo is certainly higher. “As with the Beijing Olympics in 2008, the Chinese Communist Party is using this high-profile international event as a pretext to further its campaign to ‘eradicate’ Falun Gong,” says Falun Dafa Information Center spokesperson Erping Zhang. Over 8,000 Falun Gong practitioners were detained ahead of the 2008 Olympics. Hundreds of them were sent to prison and labor camps in 2009, according to the Falun Dafa Information Center’s 2010 Annual Report (report). Dozens of those detained subsequently died following abuse in custody. In early 2009, as part of the authorities’ pre-Expo preparation, Jiang Zemin, the former Communist Party head who initiated the persecution against Falun Gong, paid a visit to Shanghai. Zhou Yongkang, current head of the Party’s political-legal committee and the politburo member charged with directing the 610 Office (details), visited the city in June. 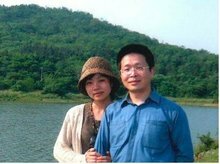 Following Jiang’s visit, local authorities’ harassment, detention, and imprisonment of Falun Gong practitioners significantly intensified. Another surge of persecution occurred after Zhou’s visit. Pudong District, where the World Expo is being held, has recorded the highest number of persecuted Falun Gong practitioners among the municipality’s districts. At least 19 Falun Gong practitioners were abducted in the area over the last 15 months, including seven individuals taken into custody on the single day of July 23, 2009. By April 2009, Pudong and at least one other district were reportedly offering monetary incentives to citizens who report Falun Gong practitioners to the police. The Pudong and Yangpu districts reportedly offered 10,000 Yuan for aiding the arrest of Falun Gong practitioners distributing informational literature, and 200 Yuan for reporting on someone who practices Falun Gong. At least 22 of the Falun Gong practitioners taken into custody in the last 15 months were abducted from their homes or places of work, sometimes by large teams of security forces conducting door-to-door sweeps in search of known Falun Gong adherents. 34 of the 127 practitioners reportedly had their homes illegally searched and ransacked by security forces, who seized electronics and other valuables, as well as all Falun Gong literature and books.